Contents Each sign is packaged with a metal wall bracket for easy installation. Spot this sign from two directions. 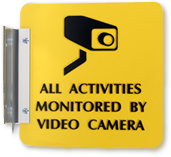 These projecting signs are ideal for hallways. Quickly locate equipment, doors, etc. 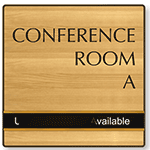 • Sign is 1/16" thick and comes with bracket to mount the sign perpendicular to the wall. • Sign has dimensional print on both sides of the solid color base material. The solid vinyl signs have elegant rounded corners. These are not engraved signs. 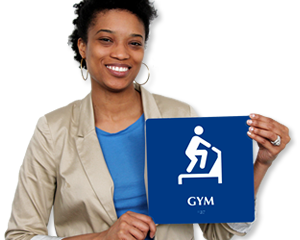 • Signs are suitable for any office, school, clinic or warehouse. Elegant enough to satisfy the pickiest of interior designers but tough enough to withstand abuse, it is easy to see why thousands of customers specify Spot-a-Signs™ for their facilities.